The Institute for Molecular Bioscience is committed to using life sciences discovery for disease application and sustainable futures. We are The University of Queensland’s oldest and largest research institute with a strong track record in working with partners to translate our research to the clinic, for the environment, for policy and for commercial application. We believe that partnering brings together the skills, facilities and resources for mutual benefit. Clear, efficient, mutually respectful, the combination of discovery-driven research and solution-focused partnerships creates an environment for innovation and application. Our Institute is committed to using life science discoveries to offer disease application and sustainable futures. We are unique in the combination of biomedical, biological, pharmacological and chemical research capabilities. This means that we can take basic science to the point of application. Our Research Leaders are some of the most highly-cited researchers in the world. This means they are global leaders of thought, enquiry and investigation. Our research strengths and capabilities span biochemistry, genetics, molecular biology, immunology, microbiology, pharmacology, toxicology and pharmaceutics. We work in Centres to support coalition and collaboration across disciplines. Because of this, we are conduit to achieving end solutions and a pipeline to end-use. We value our partners, share a passion for life science discovery and solution-driven research and a mutual respect for the expertise and philosophies of our partners. Our research facilities span imaging, computational biology, bioinformatics, genome sequencing and analysis, statistical genetics, chemistry, structural biology and drug discovery and high performance computing. This means, for example, we can identify new biological markers, pathways or influences, determine function and structure, leading to drug design and evaluation. As a result, we have spun out 11 companies, registered more than 66 patents, 104 provisional patents and 16 our licensing agreements. The Institute is committed to the employability of our research training students and early career researchers. As importantly, we are committed to ensuring that they are able to contribute to the global knowledge base and economic development of the organization in which they are employed and for national benefit. As such, we believe in the value of industry partnerships, through mentorship, placement or collaboration. As the future of R&D, we are advocates for opportunities that bring them, and us, closer to our partners. By working with the IMB, you access research infrastructure, expertise, global connections and future employment opportunities by working with our research training students and early career researchers. In addition to our capabilities and resources, the IMB can work with partners to identify funding opportunities, leveraging State, Federal and international funding schemes to offset the cost of R&D. IMB works closely with UniQuest, the main commercialisation company of The University of Queensland. They recognise the need to achieve mutually beneficial deals that see UQ researchers work with industries to solve real world problems. UniQuest considers each collaboration on its own merits and tailors IP ownership and management in consultation with our partners, facilitating competitiveness in the marketplace and identifies flexible and innovative arrangements that allow our partners to achieve their goals. In addition to the research collaborations with other Faculties, Schools and Centres in the University of Queensland, IMB collaborations span the State of Queensland, Australia and the globe. 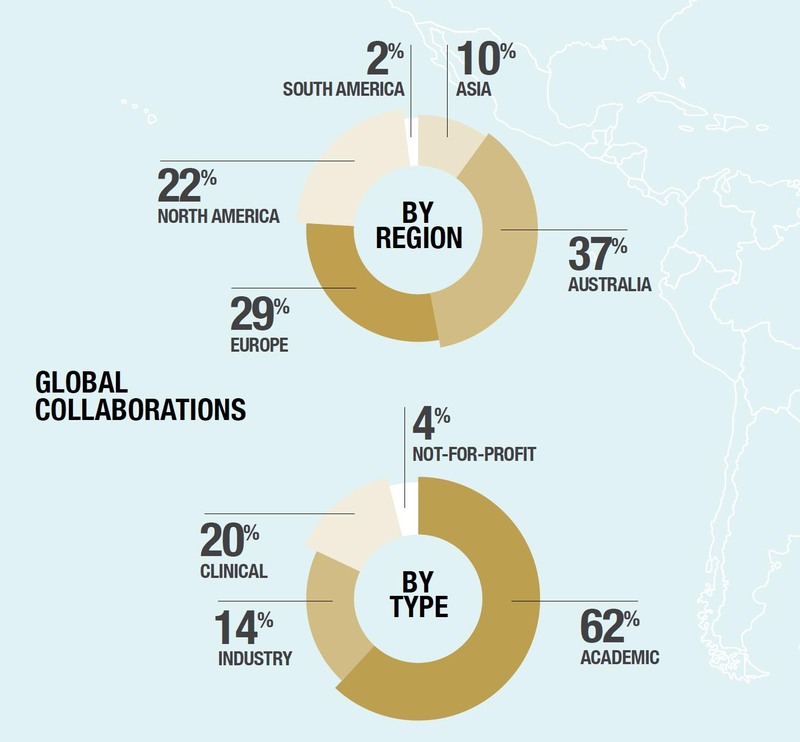 We have over 1,000 collaborations in over 57 countries. We can open the door to a world of expertise, research providers, corporate and government partners to expand the scope and depth of a response to your research needs. Our partners are wide and diverse. From other academic institutions, to health providers, industry, charities and governments, we triangulate partnerships to find innovative solutions to local, regional and international challenges. IMB: UQ’s largest life sciences research institute.